The pack bag consists of a main compartment, 1.5” tall zippered top pocket, generous wand pockets, and a Velcro loop field on the underside of the zippered top lid. Materials include 1000d cordura on the suspension side and bottom, hypalon details, and 500d cordura for the rest. The chassis is dual 7000 series aluminum stays landed in the included Prairie Belt, HPG’s signature contoured shoulder harness, and an HDPE framesheet. The qui-Ya is made in the USA by First Spear out of US materials. There are a handful of small details that are different, but that's the gist of it. Otherwise they're the same pack. The larger volume of the qui-Ya comes both from the additional 4" of frame height (additional 5.5" pack height including new pocket) and also from 2" more in girth. So which one is right for you? That depends. If you're a taller guy, the extra 4" of lifter height will be a big bump in comfort over the Ute. Even at my height of 5'10", the qui-Ya is a little more comfortable with a similar load. If this is to be a dedicated backpacking pack and you will be carrying larger volume loads (winter trips or group trips where you're taking up slack on group equipment), then the qui-Ya is indicated. On the other hand, the Ute is a better generalist. It's still the 80% pack -- small enough to use as a gear intensive daypack (like in winter or for climbing), good for international travel, but can also handle really heavy loads and multiday backpacking trips (if you're using modern compact gear and add one of our back pockets). With a 5.5" shorter height, it's also easier to navigate through areas with lots of overhanging obstacles. Both packs share the same chassis and will carry as much as anyone should carry in any internal frame pack. They will both compress down equally well, except the qui-Ya will still be taller. Here's an analogy -- true externals like the old Dana Terraframe (and the one we're still working on) are the 1 ton trucks of the load bearing world. The Ute / qui-Ya chassis is a 3/4 ton chassis. In the case of the Ute, we put an SUV body on that chassis. In the case of the qui-Ya, we put a larger body on that chassis that is better matched to the chassis' working capability. That gives the qui-Ya a better weight to volume ratio than the Ute. And it also means that if you are always carrying that much volume, the qui-Ya will be easier to get your load onto because of its greater volume. So there it is, no clear advantage, but some pros and cons for you to consider in making your choice. Looks like a hell of a pack! Thanks for showing a load being carried with the compression panel and the bag collapsed. I had it in my head that it would work with my Ute, and it has been mentioned here that it will. By the looks of that rock, it works very well. If some of the different features prove popular/awesome would they trickle down to the Ute? the lid pocket and loop field look pretty darn handy. Should be an AWESOME tall guy pack, just poked around the pack section at REI for the first time in awhile today and I'd forgotten how few of the "large" packs have enough frame for tall folks. The other significant thing about a tall frame is that you must have frame to properly stabilize a load. Our over the top stabilization method helps, but it's only a partial solution. A shorter frame simply can't carry as much volume as well as a taller frame. We've already had discussion about the top lid on the Ute. Right now, the consensus here is that even the minimal 1.5" pocket (plus the stiffness of the velcro field) can get in the way of compressing the Ute down to day pack size when that is what is warranted. On the qui-Ya, I've already learned that if I want to really compress the pack, I have to leave the top lid unzipped and folded down on the inside of the pack bag. I measured my back today to get an idea of how this pack would fit my frame/body and from my hips to the top of my shoulders is roughly 20 inches. What other measurements do you all utilize when measuring for a pack such as this? This pack has a torso length that will go quite short, so that isn't an issue for anyone. The only real variable is at what angle the load lifters will be and how tall the frame will stick above your shoulders. It's a 28" frame with a 1.5" pocket on top. So it sounds like on you the qui-Ya would be 9.5" above your shoulders with the load lifter take offs 8" above your shoulders. When internals were regularly this tall, there were often 2 sets of load lifter take offs - one at the tops of the stays, one partway down. I'm honestly not sure that the partway down ones added any value for shorter folks. This is THE pack I've been waiting for....can't wait until they are available! Which Pocket are you all thinking for the qui-Ya? The most obvious choice right now seems to be the Connor, but since I already have one of the now discontinued Highlanders, I will probably run that on it. I'll probably go the opposite, with the size of the bag being what it is, I'll probably go small and organized on the back pocket. Might start off really small with the Aston Pocket off my Aston House pack to see how it fits and go from their or might even run it naked. The beauty of it is you certainly have lots of options and can really dial it in. For winter travel, I was happy with the Connor. Lots of extra things I wanted available regularly like trail crampons and mittens. On the trip in the product video, I went back to using Palspocket which I think would be great most if not all the time. And best of all, it fits everything I want to be able to stuff in there, should I go all-out on loading it up. Had a box of awesome waiting for me when I got home yesterday. Alot like a kid on Christmas morning, I had to load it up and take it for a stroll. Threw right at 60 lbs in it and it felt great! Can't wait to get it in the woods. Very happy for you guys and a little envious, too! I'm hoping to have my hands on one soon. I got to see Evan's at our WInter Skills Event and really loved the look of it. For taller guys, the qui-Ya is going to be a Godsend. It kind of reminds me of the 1st Gen Lowe Alpine Vector packs we had on the ODAs back in the day. 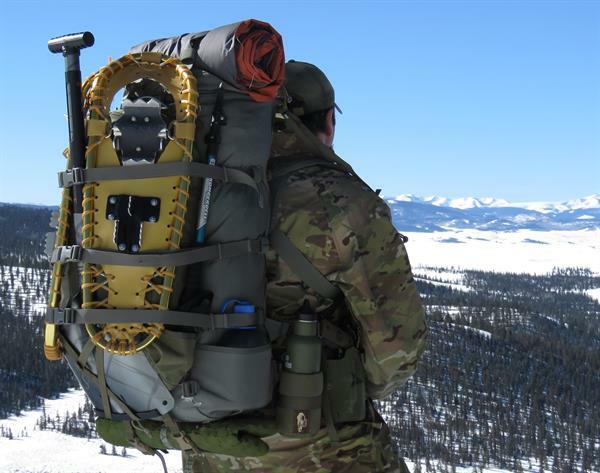 Those were a tall pack, but they sure were nice for getting all of the bulky winter gear into the ruck, along with chow, spare radio batteries, spare magazines, med gear, demo gear, etc. Is there an ETA for the Foliage qui-Ya?